One of the most award-winning and acclaimed comics series of the last several years returns to the shelves this September with a perfect new jumping-on point for new readers or those who've gotten hooked on Brubaker and Phillips hit series INCOGNITO and are craving more! 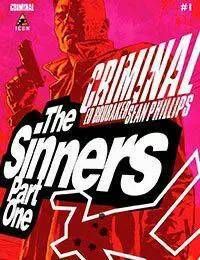 CRIMINAL's most popular character, TRACY LAWLESS returns in THE SINNERS. It's been a year since Tracy was forced into working for the bad guys, and now made men are turning up dead all over the city, in what appears to be mob-style hits. But since criminals don't go to the cops for justice… only Tracy can solve this crime.